SM Year End Sale December 26, 2009 to January 1, 2010!!! Visit any SM Mall near you! SM is now having their Year-End Sale starting 12/26/2009 to 1/1/2010!!! Feel free to share your sale hauls!!! The Eastwood City - QC New Year Countdown to 2010! Dining Reservations at the Eastwood Mall Veranda are welcome. Please call the concierge at 709-9888 or 709-0888 or 0918-8-EWCITY. Featured Online Shop COMING SOON! Due to insistent public demand, i will soon post various online retailers' ongoing sale and promo! 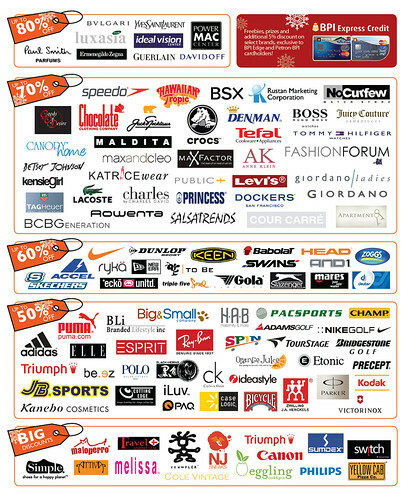 Criteria will initially base on the bloggers' limited online information of preferred brands and products. For online retailers, in case you wish to be featured on this blog, simply post a comment and hope you can backlink to us. Thank you all and Happy Holidays!!!! Globe's 12 Days of Christmas Online Promo! 1. Subscribe to any postpaid plan online and get P2k off from the regular handset price and free Super Duo for a month. This applies to all new Postpaid plan subscribers who avail of a Regular Postpaid offer starting at GText 500 with a Nokia or Samsung handset. Visit our Online Shop now! Read FAQs here. 2. Refer a friend to getting their own Postpaid plan and get 1 month FREE SuperDuo! The referral will be considered successful once your friend's Postpaid plan account is activated. Minimum plan referral is a GText 500 and can be bundled with ANY handset brand. Visit our Online Shop now! Read FAQs here. 3. Get your Globe tattoo kits online and get P1,000 worth of call cards. 4. Get your broadband and landline bundles only through Globe Online shop and get free gadgets (printer, webcam and headset). Hurry and subscribe now! Offer only until Dec. 31. Wine Lovers! Stock Up & Celebrate New Year with A Cheer!!!! CLICK HERE TO CHECK THE BUBBLY BRAND WAITING FOR YOU! ATTENTION - GLOBE POSTPAID SUBSRIBERS!!!! Catch your favorite Disney characters on Ice at 10% discount!!! Globe makes the Christmas season even more heartwarming with a special discount to see Disney on Ice! Whether you’re a kid or a kid at heart, let Disney’s magic warm you and your family this Christmas season. Watch your favorite Disney characters twirl and dance on ice at the Araneta Coliseum from December 25, 2009 to January 3, 2010. All Globe Postpaid subscribers get a special treat! Avail of a 10% discount on your tickets by simply showing your Globe Postpaid billing statement (October – December bill) and valid I.D. upon ticket purchase at participating Ticketnet Outlets. Promo begins on November 13, 2009 until January 3, 2009. Per DTI-NCR Permit No. 6103, Series of 2009. All tickets to be purchased within this period are valid for the 10% discount. • Only by-the-counter purchases are valid for this promo. • Only the General Admission ticket is not part of the promo. All other ticket denominations can avail of the discount. Visit Globe for more details! Click HERE!!! 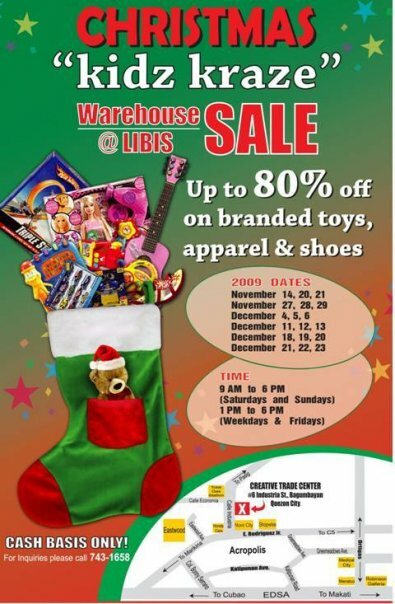 Eastwood Mall presents The Great Toy Sale!!! Air Asia's 8th Birthday Blowout!!! Pre-book and get your favourite seat now! Get top travel tips on AirAsia's destination guide. Get exclusive deals! Sign up for RedA!ert. Visit http://www.airasia.com/site/ph/en/home.jsp for more info! Be prepared to be a kid again when world-renowned Disney On Ice returns to the Araneta Coliseum for a series of "ice-capades" starting December 25, 2009 until January 3, 2010! Starting November 5 to January 3, BPI CREDIT CARD cardholders can enjoy 12% discount. They must use their credit card to avail of the discount. No limit on the number of tickets to purchase. GENERAL ADMISSION area not included in the discount. From November 6 – December 27, 2009 every single receipt purchases worth P300.00 from any Araneta Center establishments, (Gateway Mall, Coliseum Circle Restaurants, Shopwise Arcade Restaurants, Ali Mall, Farmers Plaza, New Frontier Arcade, Telus Arcade, Supercenter, Auto Centro, Araneta Center Bus Station and Farmers Market) entitles a customer to a raffle coupon for a chance to be one of the ten (10) winners of Upper Box VIP tickets with a Meet and Greet sessions after the show on January 3, 2010, 6pm at Araneta Coliseum. Customer also automatically gets a 10% discount coupon. The discount coupon may be used in purchasing tickets at the Araneta Coliseum Box Office. Strictly one discount coupon per ticket purchase only. To get a raffle coupon, the customer must present his/her receipt at the redemption booth located at the areas mentioned below. Promo representatives shall mark the receipts "claimed" or "redeemed". Only P100.00 minimum purchases with official receipts, official Cineplex tickets, paper tape receipts, cash & sale invoices with tax identification numbers (TIN) officially dated from November 6 – December 27, 2009 are considered valid. This does not include receipts and/or invoices from purchase of gift certificates, payment of mobile phone bills, telephone bills, electric and other utility bills, credit card & the like. Customer must legibly write his/her complete name & address, landline number, mobile number, e-mail address and signature; then drop his / her raffle coupon/s at any of the drop boxes located at the redemption booths mentioned above. Cut-off for dropping of raffle coupons will be on December 27, 2009, 9pm. Raffle draw will be on December 28, 2009, 5pm at the 9/F Marketing department, Aurora Tower, Araneta Center, Quezon City with the presence of a DTI representative. Winners will be notified through a registered mail, text message or phone call. Winner's names will also be posted in the mall. All prizes should be claimed at 9th flr. Marketing Dept. Aurora Tower Quezon City, from Mon – Fri 10:00- 4:00 pm. Only winners with valid raffle claim stub and a photocopy of any valid ID with photo (e.g. driver's license, passport, company ID, SSS ID, etc.) can claim their prize. Prizes not claimed on or before January 2, 2010 will be forfeited in favor of Araneta Center with prior approval of DTI. The show ticket allotted for the winner can only be used on January 3, 2010 at 6pm. All Araneta Center employees, Agency personnel, its sister companies, lessees and their relatives up to the 2nd degree of consanguinity or affinity are disqualified from joining the promo. Starting November 1 to January 3, BANCO DE ORO / EQUITABLE CARD or AMERICAN EXPRESS cardholders can still enjoy 12% discount. They must use their credit card to avail of the discount. 2. Cash and card buyers of credit card companies will now be honored. 3. No discount will be honored except for 20% Senior Citizen discount. Should you have any questions, please feel free to contact us at: 913-9575 and 913-9577, or at disneyonice@aranetagroup.com. Visit http://ticketnet.com.ph for more details!!!! Updated list of all tiangges/bazaars happening in the Metro!!!! December 12 to 13, 19 to 20, 10 a.m. to 8 p.m.
December 1, 8:30 a.m. to 2:30 p.m.
A P999 Christmas Seat Sale for Domestic and International destinations! Tis' the seat sale to be jolly with our P999 Christmas sale for domestic and international destinations! The seat sale starts now until December 6, 2009, for travel from January 1 to March 31, 2010. All our 32 domestic destinations are up for grabs at the ‘Go Lite’ seat sale fare of P999. This includes direct flights from Cebu to Butuan and Surigao, as well as flights from Manila to Kalibo (Boracay), Naga, San Jose (Mindoro) and Laoag. We also fly direct from Davao to Zamboanga, Iloilo and Cagayan de Oro. Avail of P999 ‘Go Lite’ seats from Manila to Taipei and Kota Kinabalu, and from Clark to Hong Kong, Macau, Singapore and Bangkok. Flights from Manila to Bangkok, Ho Chi Minh, Macau and Guangzhou, and flights to Hong Kong and Singapore from Manila and Cebu are also available for only P1,499. You can fly for only P1,999 to Incheon from Manila or Cebu, and to Busan from Cebu, or opt to travel from Manila to Shanghai, Kuala Lumpur or Jakarta. Manila-Osaka seats are also available at the ‘Go' fare of P1,999. 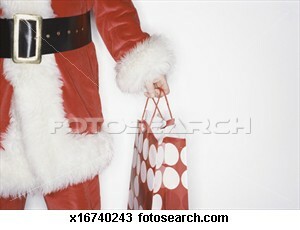 Hurry, grab your Christmas seats for P999, book now at www.cebupacificair.com. PAL's Early Holiday Treat - Go To Hong Kong for only US$ 98! Early Holiday Treat for passengers going to Hong Kong! Avail of our special promo fare for USD 98. Fare is inclusive of surcharges and exclusive of government taxes and airport fees. Airline fares, government taxes and fees are subject to change without prior notice. Valid Round Trip travel on Fiesta (economy) class. Win Gifts DAILY In Cosmo's 12 Days Of Christmas Promo! Cosmo.ph is giving away gifts from December 1 to 12, 2009 to all their avid online readers!!! All you have to do is answer the promo question set each day when you comment, for a chance to win the day’s featured item. The first commenter doesn’t always win and neither will having the most number of comments make you win (in fact, we wouldn't like you to comment more than twice). 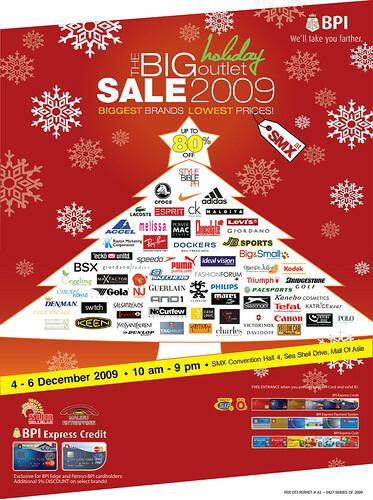 Again, promo will run from December 1 to 12, 2009 only. Visit http://www.cosmo.ph/ for more details!